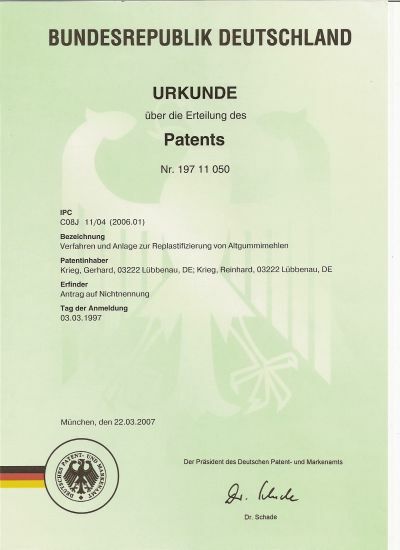 Als Patentinhaber des Patentes DE 197 11 050 mit Erteilung des Deutschen Patentamtes vom 22. 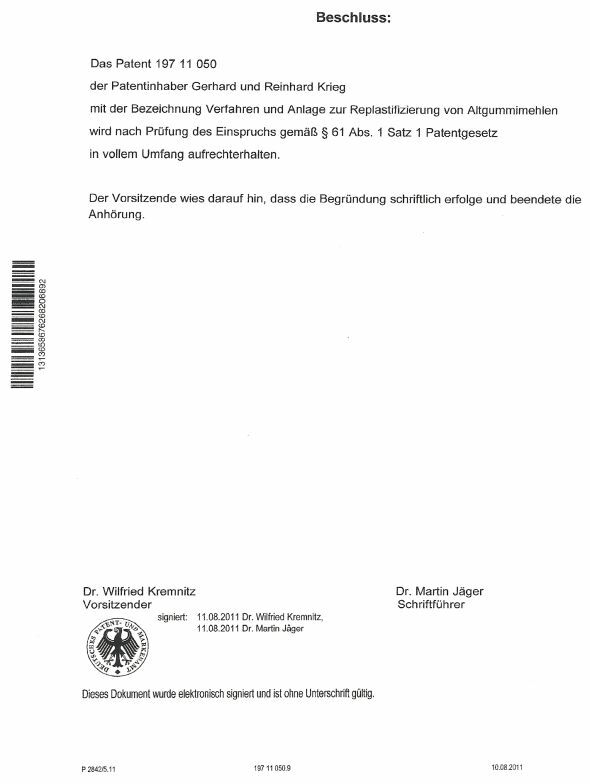 März 2007, warne ich, Gerhard H. Krieg und als Patentinhaber, eindringlich jedermann vor fahrlässiger oder vorsätzlicher Verletzung des Urheber- und Patentrechtes. Bereits das Vormischen des Replastikats oder auch Devulkanisat genannt, wird als Versuch und damit als kriminelle Handlung betrachtet. Gleichfalls der Ankauf und die Einfuhr des daraus gewonnenen Rohstoffes in die Bundesrepublik Deutschland. Jeder Verstoß zu unserem Schaden wird zur Anzeige gebracht. 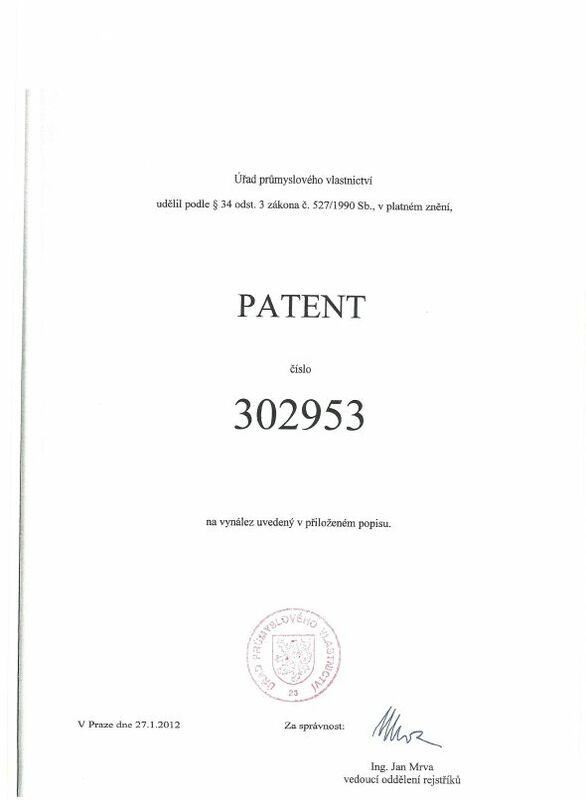 As a patentee of the Patent DE 197 11 050 with granting of the German Patent Office from the 22nd of March, 2007, I warn, Gerhard H. Krieg as a patentee urgently each about careless or deliberate injury of the right and patent right. 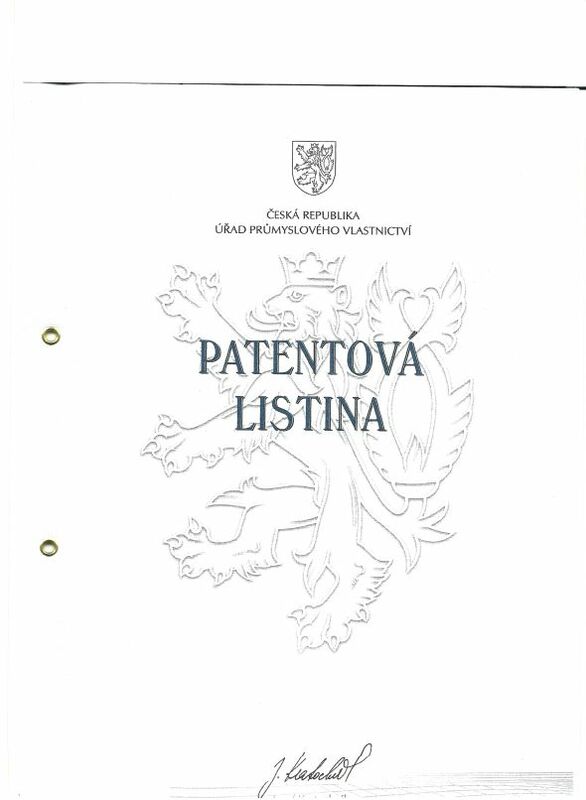 Already the pre-mixing, of the Replastikator also rubber devulcanisation material called, is looked as an attempt and with it as a criminal action. Also the buying and the import of the precalled raw material in the Federal Republic of Germany. Every criminal act against to our damage will get a charge. 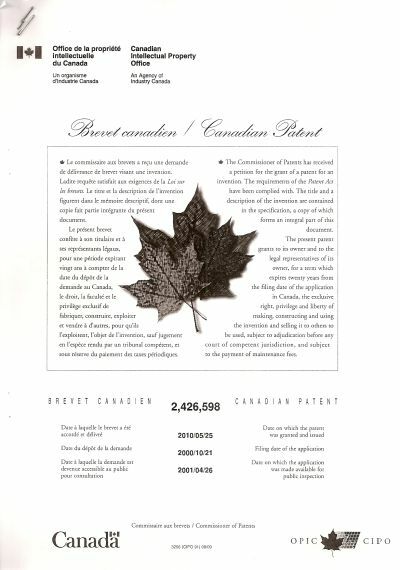 Warning against patent infringement ! Devulkanisation ohne Depolymerisation des Technologieinhabers Gerhard Krieg. 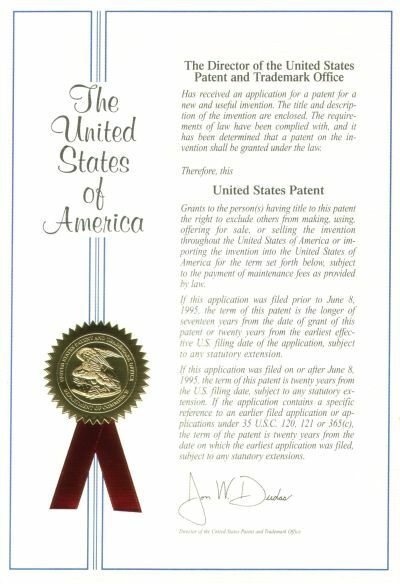 The invention relates to a method for replastifying used rubber powder wherein a powder mixture of chemical activators is produced and subjected to a mechanochemical treatment. Said method improves bonding and co-vulcanization of the mixture in an original fresh mixture as well as the surface quality of freely vulcanized articles by briefly heating the mixture before conducting mechanochemical treatment, wherein an ester plasticizer is also added. The present invention relates to providing novel microbead coating compositions having improved binding properties for the glass microbeads suspended therein, which compositions also have superior bonding properties for substrates so as to be resistant to peeling or flaking therefrom after drying. According to the present invention these novel binding and bonding properties are unexpectedly produced by the addition of microparticles of ground rubber to microbead coating compositions containing a resinous binder material and, optionally, other color-enhancing particles such as pigments, glass flakes, metallic flakes, mica and similar materials as disclosed in co-pending U.S. Ser. No. 09/752,305, discussed supra. The rubber particles, known as crumb rubber and pelletized rubber are commercially-available from Spreerelast GmbH, Ardennering, Germany under the trademark Relaston® MT and DT (devulkanized) having grain or particle sizes of 100μ, 120μ, 150μ, 160μ, 180μ, and larger. The rubber particles are produced cryogenically by freezing and grinding scrap tire rubber elastomer to the desired grain size and smooth surface. Particles having a grain size of 150μ or less are preferred for use in the present compositions. They have the appearance of a powder and are grey in color.